It is critical to keep your PC safe and secure at all times as it is your best bet to avoid programs such as Merry X-Mas Ransomware. Just like any other program classified as ransomware, this one is extremely dangerous. It can identify and then lock your personal files without any authorization. It should be quite obvious that such functionality could have devastating outcomes, to put it lightly. It is important to note that a large number of users come across this malicious program because they lack knowledge regarding virtual security and its importance. Therefore, malware experts working at our internal labs provide further information about the inner workings of this ransomware along with a few critical virtual security tips that will allow you to keep your PC safe and secure at all times. Additionally, we present a detailed removal guide that will help you completely delete Merry X-Mas Ransomware without a lot of trouble. Since there are numerous ransomware programs roaming the web nowadays, it is not surprising that Merry X-Mas Ransomware functions in a relatively similar manner to its contemporary counterparts. Once it enters your operating system and is launched, it will immediately identify data on your hard drive and then start locking it. It is critical to highlight the fact that this malicious program is designed to work in a silent manner. That is so unsuspecting Internet users would not realize that a malicious procedure is taking place. The whole process is quite quick thus catching it in action might require advanced computer knowledge. To denote the encrypted files, this malicious program tags them with the .merry extension. The devious program in question drops a file called "merry i love you bruce.hta", on your desktop, which is a ransom note. It basically tells you that your data has been encrypted and that you have a limited amount of time to pay a ransom in return for a decryption procedure. It is imperative to note that paying the ransom is not a guarantee that you will be able to use your files once again because cyber crooks are not obliged in any legal way to actually provide that service even if you make the payment that they request. Make no mistake and delete Merry X-Mas Ransomware as soon as possible to limit the data loss imposed by it. Do so by carefully following the instructions that we present below. It goes without saying that virtual security should be every Internet user's utmost priority. Only by keeping your personal computer secure at all times will you be able to avoid malicious applications as such as Merry X-Mas Ransomware. In quite a few cases this devious program is spread via spam e-mail campaigns. Often such emails are designed to appear as something important or urgent. Thus, our researchers recommend refraining yourself from all suspicious attachments that came your way from unknown sources. In other instances, you could come across devious programs by simply entering suspicious third-party sites crafted by malware developers. Often sites created by cyber crooks are designed in such a way that just entering them is more than enough to get your personal computer infected with some unknown malware. In the majority of cases, Internet users end up on such web pages by clicking on suspicious third-party ads or pop-ups. Therefore, being careful about such questionable web content could save your PC from being infected with a harmful piece of software. Of course, your best bet to maintain a fully secure system is by having a professional antimalware tool active on your PC. It is paramount to have such a tool since it provides overall virtual security at all times, meaning that it could warn you beforehand about any suspicious content on your PC or online. 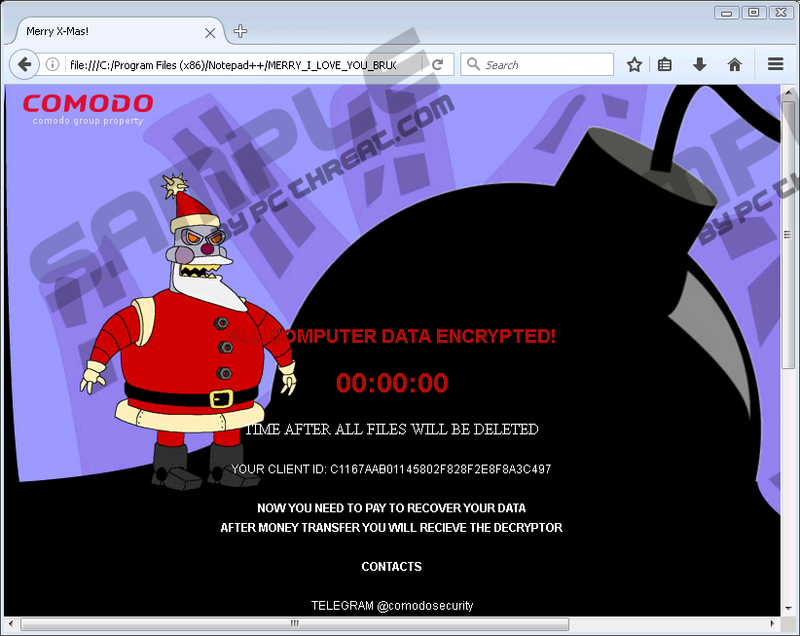 The complete removal of Merry X-Mas Ransomware is essential, to say the least. Make sure not to delay the procedure under any circumstances. It is important to note that you must remove every single bit of this ransomware as just few leftovers could be enough for it to continue its malicious functionality. To be sure that the termination has been successful, you need to execute a detailed analysis of your PC for traces linked to Merry X-Mas Ransomware right after you are done with the manual removal. You can also check your computer for leftovers of this devious program by running a full system scan with a reliable antimalware tool as it can identify and delete anything associated with this malware automatically. Locate a malicious .exe file, then select it and tap Delete on your keyboard. The name of this file is randomized. Quick & tested solution for Merry X-Mas Ransomware removal.